Hooray! It's One Thimble time!! 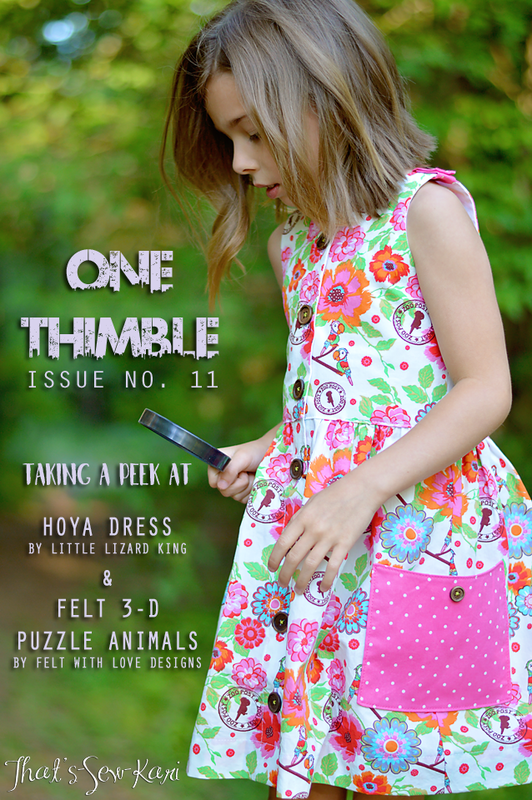 If you're not familiar, One Thimble is a high-quality digital magazine (or e-zine) containing several (typically 10+) patterns, as well as helpful articles and mini-tutorials designed to take your sewing or business to the next level. You'll also find exclusive coupon codes inside to many different shops! This issue's theme is URBAN JUNGLE and I'm always amazed at the consistency of the photos and fabric selection throughout the entire e-zine. It reads just like a real magazine (especially so if you are on a tablet). When I browse through my issued of OT, I'm sitting in my recliner with coffee in hand and ogling all the new goodies and making mental notes on which patterns to bump to the top of my sewing list. With a price tag of just $25 AUD (Roughly $18 USD), the value cannot be beat. All in all, there are 12 patterns and 26 articles. There are so many great patterns included that it was hard to narrow it down. A few of the patterns are suitable more for Fall/Winter (current Australian seasons) so I will wait to make those in a couple months. It's already quite warm here as we are finishing Spring and heading into Summer. 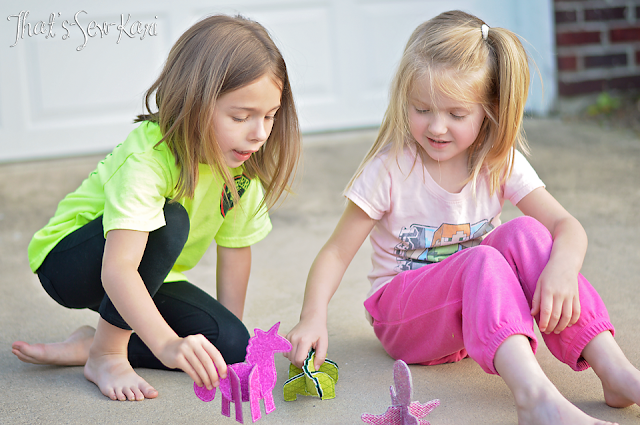 I decided I'd make the Hoya Dress (Little Lizard King) and try out the Felt 3-D Puzzle Animals (Felt with Love Designs). 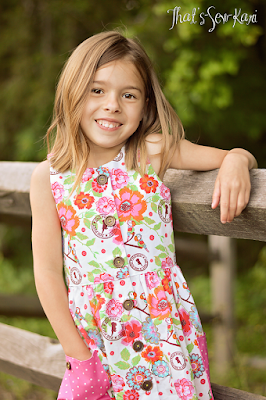 The Hoya Dress by Little Lizard King is a button down, safari-inspired sleeveless dress (Sized 12m - 12 years). The bodice is fully lined with all seams enclosed and following the designer's tip in the pattern, I used French seams on my skirt making the inside almost as lovely as the outside. Two extra large pockets and shoulder tabs stand out in contrasting fabric. This pattern is very easy to put together. In a just a few hours time (less if you sew quickly), you will be finished! Honestly, for me, the most time consuming part is the buttonholes. I use my embroidery machine to sew them, but due to small embroidery field, it meant I had to rehoop for each buttonhole. But, perfect buttonholes every single time, make it well worth the extra couple steps. 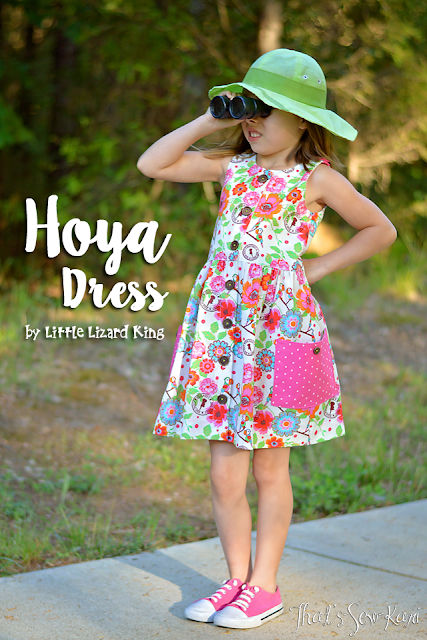 This is my daughter's 2nd Hoya Dress. The first one has been worn several times so far! My daughter's two favorite things about this pattern are the POCKETS, and the fact that she can get it on and buttoned all by herself. I chose the gorgeous Euro poplin in a Parrot print that had been sent to me by my dear friend Rebecca of Candy Castle Patterns. I think I've been holding on to it for about 2 years now because I couldn't bear to cut into it! - I think this was the perfect project for it. With my first Hoya, I used a geometric print and paistakingly matched the print across the placket. When I started to cut this dress, I threw caution to the wind and decided not to worry about matching. At the last second, I decided to switch my skirt fronts with each other. I really didn't have any reason, but felt compelled to. As I topstitched the last placket in place (the top), I was a little ticked I hadn't taken the time to see where the placket would fall and I ended up cutting off the parrots' beaks. ACK! So I laid the pieces in place to assess the damage and I ended up staring in disbelief. MY FABRIC MATCHED perfectly! Obviously, the sewing gods had seen me slacking and intervened. I should buy a lottery ticket! HA! 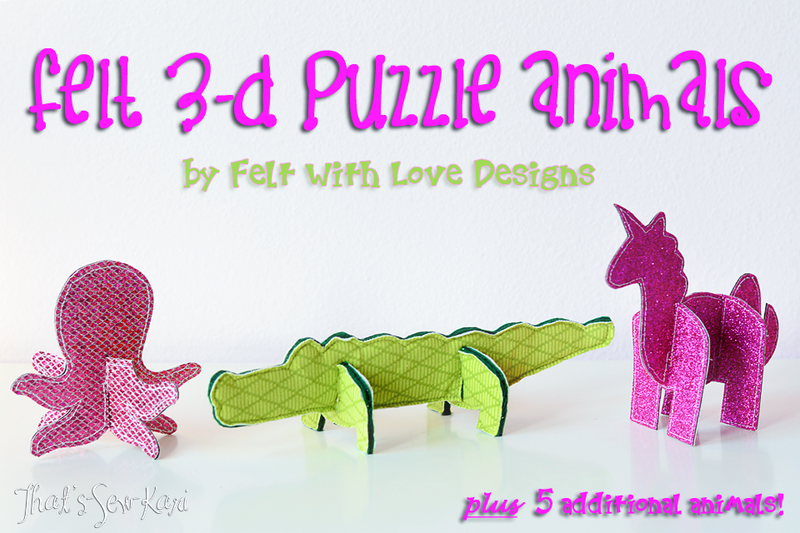 For my second selection, I decided to try out the Felt 3-D Puzzle Animals by Felt with Love Designs. Included in the pattern are 8 animals - Octopus, Alligator, Unicorn, Elephant, Rhino, Turtle, Giraffe, and Lion. 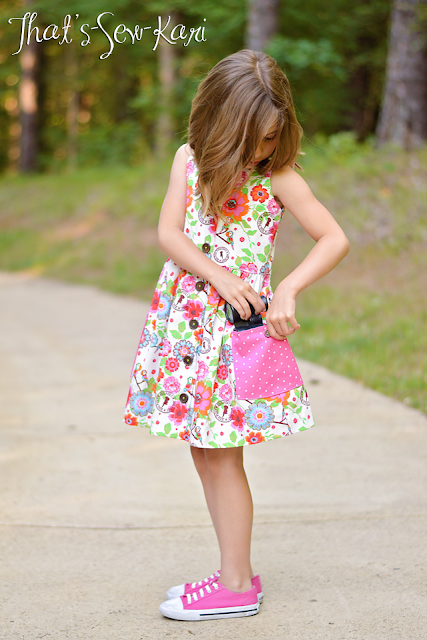 The pattern is super easy and is a great scrap-buster. I didn't have any wool felt on hand, but Hobby Lobby does offer some stiffer sheets which I used for the centers. I also just cut out my pattern pieces and pinned it on top of my layers and used that as a guide for sewing, in lieu of tracing onto the felt. As I was looking through my stash of random things I've purchased at Hobby Lobby (please tell me all people do this). this glittery sheet caught my eye. I just had to turn it into an octopus. 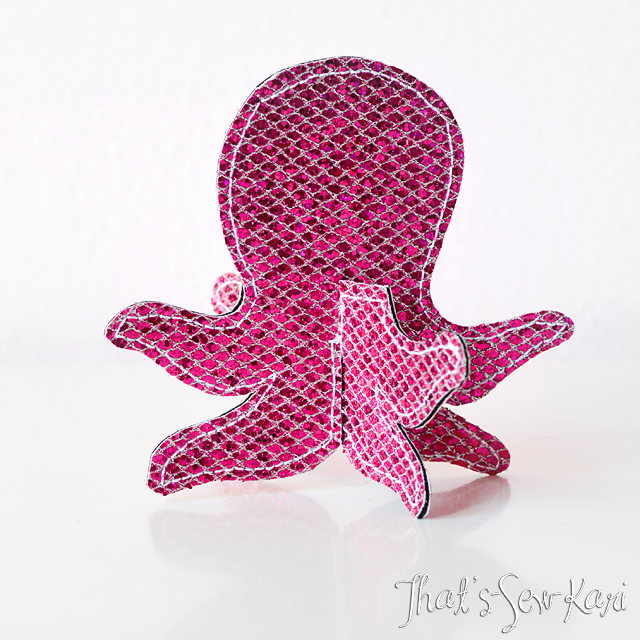 The only tricky part of the octopus is maneuvering all those curves. (I need to practice a tiny bit more). My 5 year old requested an alligator. I decided I would add an additional outer layer of leftover knit (designed by Patty Prann Young of MODKID). Isn't he so adorable?! 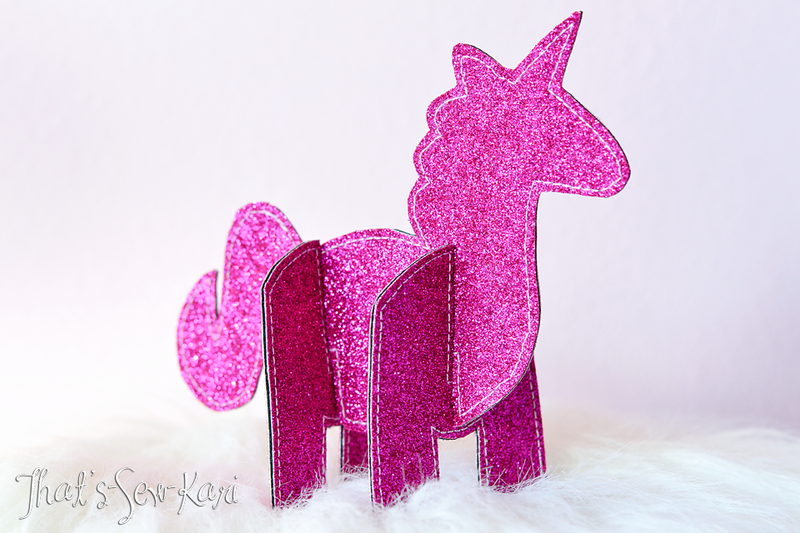 I knew my 7 year old would be over the moon with a glittery pink unicorn. She was so excited to meet her new friend when she came home from school. This pattern was so much fun! I am a preschool teacher and will definitely be making a set or two to add to my classroom. The 3 year olds in my class next year will LOVE them! My girls wasted no time in rushing off to play with them, creating an entire story line about them being a family. I couldn't even coax them into changing their clothes to be a bit more "picture-ready" -- I'll call that a win in the pattern column. 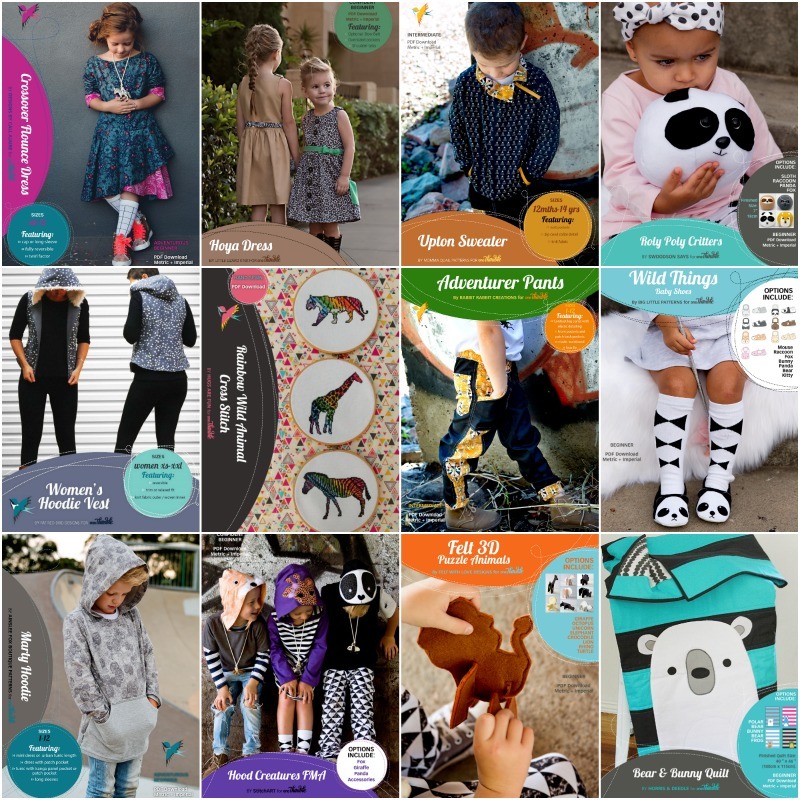 Of course, there are TEN additional patterns included -- and wow, what a diverse selection! I seriously debated sewing up a Women's Hoodie Vest for this tour, but I can't decide on my fabrics (HELP -- what's in fashion?!). I will most definitely be sneaking in a PANDA Roly Poly Critter for my 7 year old (maybe on Sew a Softie Day - July 16th) and my 5 year old would adore a FROG quilt from the Bear & Bunny Quilt Pattern. When it turns colder, I will step out of my comfort zone and push my skills with the Upton Sweater. What patterns are you most excited about? Comment below! I enjoyed the articles as well. It's always so great to see familiar names in a magazine from some of the sewing groups online. I was very excited to see a tutorial on Freezer Paper Stenciling. I have never tried, but always wanted to. I also learned that making a double pull zipper is super easy -- I had no idea! Reading Sarah Hansen's sewing story was inspirational and reminded me it's never too late to start in on a hobby -even if it's on a whim. There are so many more great articles and tips in the magazine that I couldn't possibly talk about each one (or you'll be here ALL day). I am so excited to be on Pattern Emporium's first ever blog tour!! 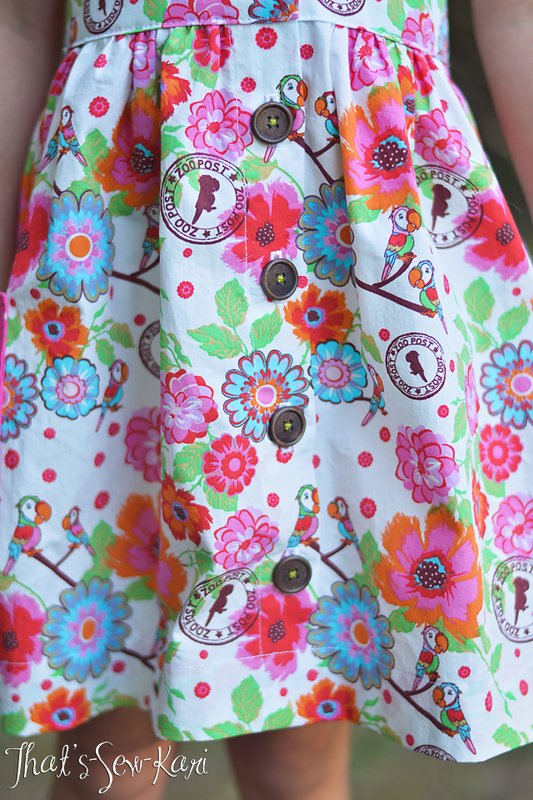 I had been eyeing this Lovebug Skirt since it released and I HAD.TO.HAVE.IT. In fact, I may have told Kate that I'd sew a bajillion before the blog tour.... of course, I may have momentarily forgotten that I have these little things like kids, a husband, a job, housework, etc... so sadly, I've only finished the one (womp, womp). But, I do have a 2nd one half sewn! Enough about my woes, though.... let's talk about what I did make! 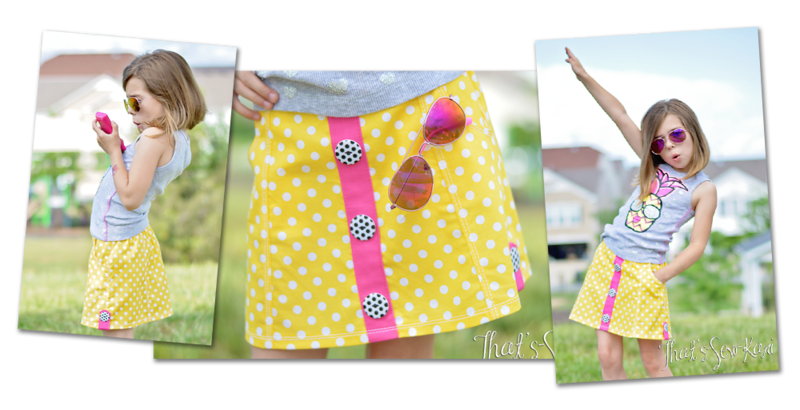 The Lovebug Skirt is an A-line skirt with loads of options and hacks. 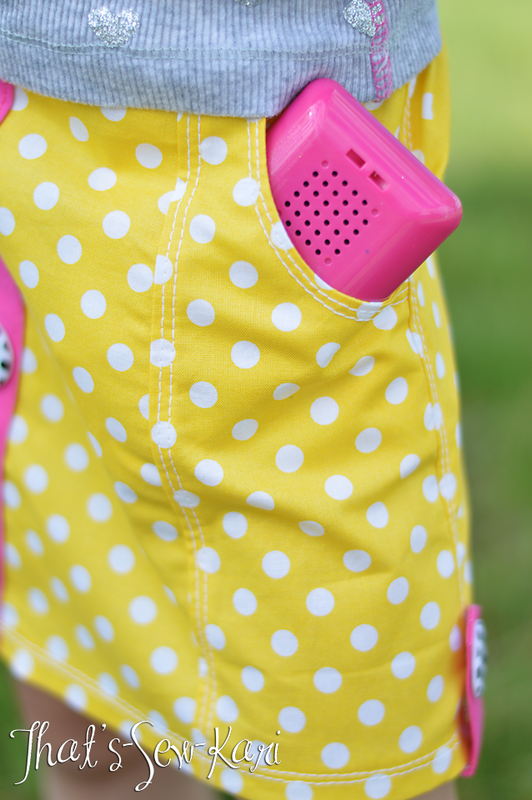 It comes in 3 lengths (mini, knee, and maxi) and covers sizes 2-12. There are also 2 pocket styles (patch and jean-style), a faux belt, cargo-style button tabs, and a mini Chelsea hack. 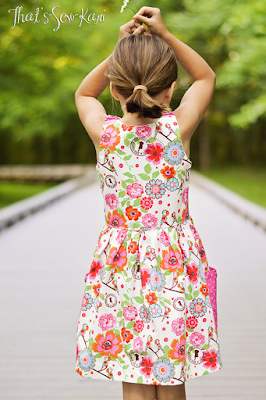 If you haven't sewn a Pattern Emporium pattern yet, you need to bump it to the top of your list! Kate's patterns are so professionally put together, you will think you're reading a magazine. She has literally thought of everything, but not to worry, it's not too wordy or overwhelming. She also includes pattern pieces for each piece needed -- even rectangles like waistbands. On each pattern piece, you'll also find a little picture of what the piece looks like after it's cut. If it's a mirrored cut (meaning cut a pair), you can easily see what she means by that! That's so helpful for newer seamstresses. I drew my inspiration from my daughter's tank top. As I walked through the living room, mentally browsing my fabric stash, there it sat on top of the laundry. I stopped, looked, and knew immediately this would be the first Lovebug I'd sew. Luckily, I had leftover fabric in yellow from a dress I'd made myself last summer and of course, I always have pink here. The buttons were a lucky find at my local Hancock Fabrics that's sadly closing down. I chose to sew the MINI length, JEAN pockets, BUTTON TABS, and MINI CHELSEA hack. I'm so in love. More importantly, so is my daughter! She can't wait to wear it to school, but is willing to wait just one extra day because today is ART and she thinks she might be painting. The details included in the pattern, like topstitching really take this skirt to the next level. Kate also has detailed instructions on how to blend sizes. My 7 year old is petite so I blended a size 4 width with a size 6 length and it's a perfect fit! 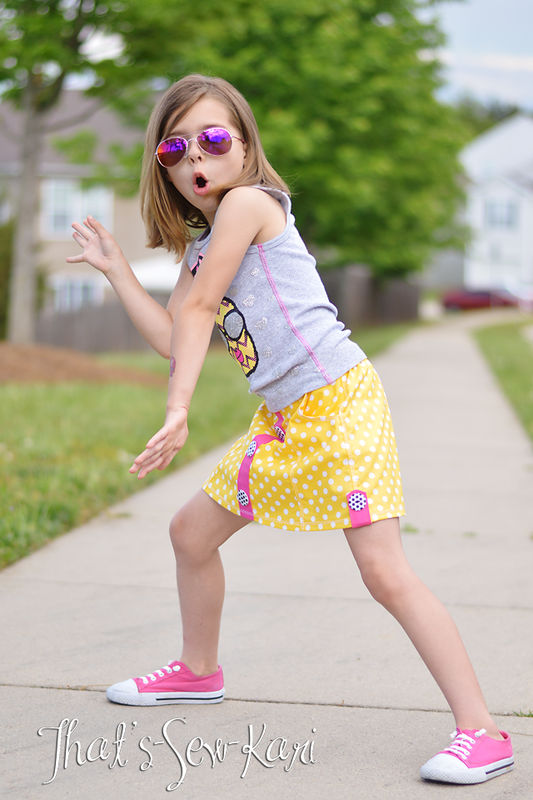 WARNING: Wearing this skirt may cause wearer to randomly bust out her best ninja moves. Proceed with caution. I wish I had gotten my other skirts done in time to share today -- I will say, they look fabulous in my head. Don't worry, I will be sharing them shortly!! 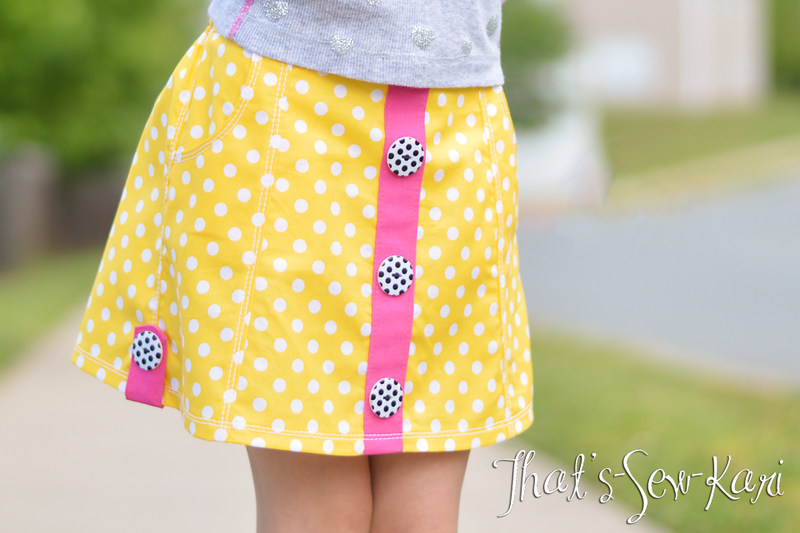 This skirt is so much fun to make. 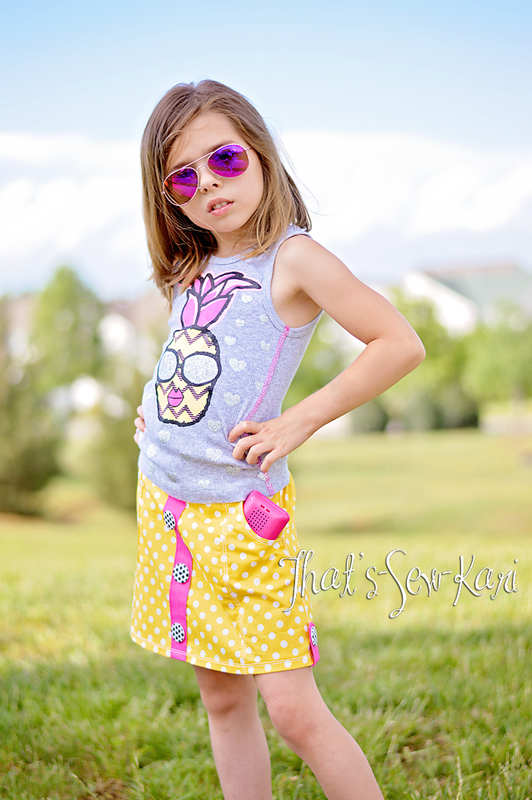 Kate has generously allowed my to give away ONE copy of the Lovebug Skirt so be sure to enter at the end of the post! 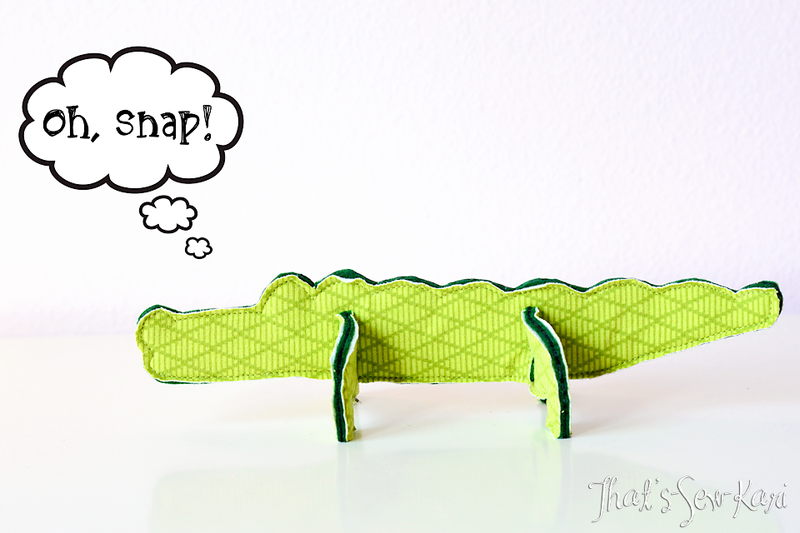 Be sure to visit these links and check out the gorgeous makes from the rest of the tour stops! So many patterns are featured.